Nervous System Chart 20"x 26"
Vascular System Chart 20"x 26"
AllegroMedical.com presents The 3b Scientific Anatomical Chart - Rheumatic Diseases, Paper . Paper charts are the most economical choice. The charts are printed on premium glossy paper. Human anatomical charts and posters are helpful aides in teaching human anatomy, patient education and medical studies. All anatomy charts are available in 19.7 x 26.6 in (50 x 67 cm) unless otherwise stated. 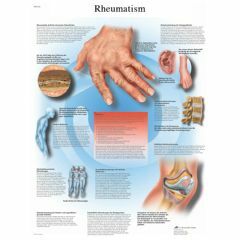 Anatomical Chart: Rheumatic Diseases; chart measures: 20x25in. 50x67cm. Paper. I just received your message and wanted to thank you for all the attention you have given to this issue and in getting it resolved. All your efforts are appreciated. You obviously care about the customers and that speaks a great deal for your character and is a distinct asset to your employer. I hope they take note of your work ethics and that you prosper in your position. Should they like confirmation of our thoughts on this issue they are welcome to contact me.